Swansea City have finally signed striker Itay Shechter from Kaiserslautern on a season-long loan. The move was held up by paperwork, but Swansea secured a work permit and international clearance for the Israel striker on the final day of the transfer window. Shechter's move was completed in time for him to be available for selection to face Sunderland on Saturday. He played in Swansea's final pre-season game against Stuttgart on 11 August. 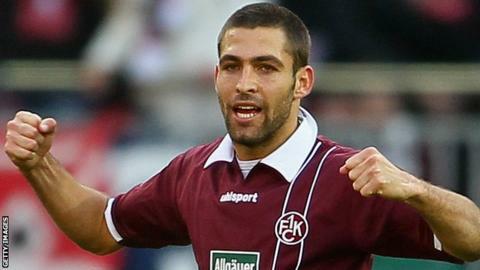 Shechter signed a four-year deal with German side Kaiserslautern a year ago but struggled in his debut season. He scored only three goals from 23 appearances, having arrived at the club with a prolific scoring record at Hapoel Tel Aviv. "I'm very happy,'' said Shechter, who can play anywhere up front or in behind the central striker. "It will be a dream to play in the Premier League because it is the best in the world. "The manager [Michael Laudrup] was also a big draw for me. Growing up watching him play was unbelievable. "For me he was the top player in the world playing at the best clubs, like Real Madrid and Barcelona, where he was also a champion."